I don’t know about you, but in my family it seems like January is the month everyone get sick. In the last month we have had multiple colds, an ear infection, strep throat, pinkeye, and a stomach bug. Not only are my kids less likely to eat well when they’re sick, but I seem to forget how to feed myself. Taking care of sick children puts me back in my college nutrition. All of the sudden it’s pizza, Diet Coke and lattes again. That’s where this recipe is ideal. Chicken soup really does help when you’re sick! There are even scientific studies about it. The broth is hydrating (and if you use this method it’s full of collagen). The veggies provide vitamins and the chicken has protein. The heat of the soup loosens mucus and it’s easy to digest. It’s also great fuel for mamas, helping us power through the challenges of caregiving. First, take the white meat off the chicken and remove as much skin as possible. Check to make sure there’s no strings tying it up. Cook on high pressure for 35 minutes and then do a quick release. Meanwhile, prep the veggies and shred or chop the chicken breast. Remove the chicken from the pot and strain if necessary (see notes). Add veggies and broth back to the pressure cooker and cook on high pressure for 12 minutes with a quick release. While the soup finishes cooking, remove the remaining chicken from the bones and shred or chop. Season with parsley and salt and pepper to taste. To serve, put the desired amount and type of chicken in your bowl, then add the soup. Enjoy! This recipe takes a little while, but it’s easy to make in stages. You can always let the soup hang out in the pressure cooker between steps, just keep it on warm. I frequently make chicken salad out of most of the chicken breast and then make soup with the remaining meat and bones. It’s a great way to get the most out of your chicken. You can make soup with raw chicken leg quarters, but the broth isn’t as good. 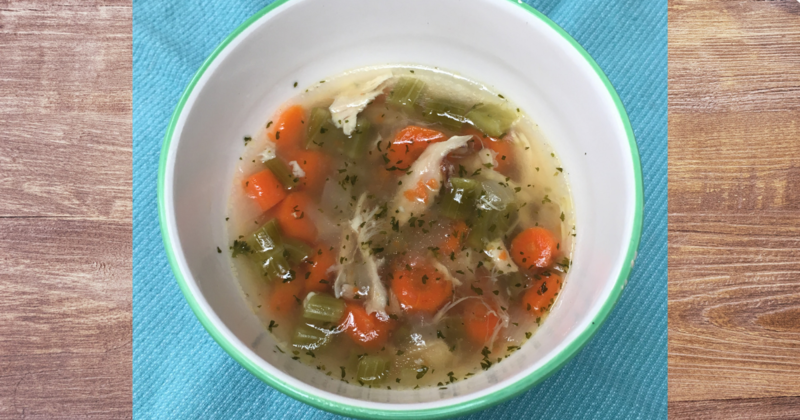 Rotisserie chicken makes incredible broth because all the collagen is more readily available. This soup almost sets up like jello in the fridge. So nutritious! I’m sure you noticed that there aren’t any noodles in this recipe. I don’t put them in because they get mushy and unpleasant when you refrigerate the leftover soup. I prefer to serve this with crackers or a grilled cheese. If you want noodles or rice, add them after the veggies are cooked and use the sauté function on the pressure cooker to cook them. I usually strain this broth with a colander, although if creates extra dishes. My kids have a low tolerance for finding anything unwanted in their soup and occasionally I miss a couple small bones if I don’t strain the broth. I put a colander in a large stainless steel bowl and then set the bowl in the sink to prevent accidental spills. You can make this whole recipe on the stovetop, it just takes a lot longer. Budget 3 hours to make the broth and at least 30 minutes for the veggies. Everyone in my house loves this soup. I make it a couple times a month all winter, even when we’re not sick! Hope you’re all staying warm and healthy!! !